A new build explorer yacht, currently code named the OCEA 125XP, has been listed for sale by Foulques de Raigniac at Camper & Nicholsons International. Designed by Joubert-Nivelt, she will be built in aluminium by French yard OCEA to MCA class with delivery scheduled for 2018. Accommodation is presently configured for 10 guests in four cabins consisting of a main deck master suite with a private sun deck, two doubles and two twins, each with a Pullman berth, and all cabins will have en suite bathroom facilities. The upper deck has an open plan main saloon including comfortable seating, a bar, fridge and state of the art entertainment centre along with a separate dining area. The aft deck on this level is designed for al fresco entertaining and dining with built in upholstered seating and tables. More outdoor space will be available on the foredeck, fitted with sun pads. The vast lower aft deck is intended for stowage of two tenders, water toys and diving gear. Twin Caterpillar diesel engines will give her a cruising speed of 12 knots and a range of 5,000 nautical miles, making her a true world-girdling explorer yacht. This yacht for sale is a development of the OCEA Commuter 108 high seas yacht. The first one completed a round the world family cruise with ease during the first two years of her existence. 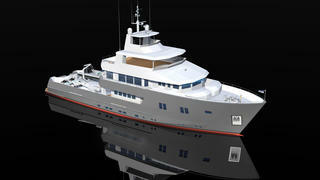 Available to view at the yard, the OCEA 125XP explorer yacht is asking €17.9 million.